The MBD Health Fair - 06/12013 - wasorganized by the MBD Clinic and the MBD Housing corporation. MBD Clinic represented by Dr. Gogineni, Nurse Roddy, Dr. Claire, and 3 Medical Students provided screenings for BP, weight, Diabetes for more than 200 people. Ms. Flynn provided nutrition education. Brochures on Diabetes, Cholesterol, losing weight, HTN, cancer screening and STD prevention were handed to the public. On May 9th, a Bone Marrow Donor Registry Drive was organized by The Department of Family Medicine on behalf of Simone Douglas, R.N. (Inpatient--16th Floor) who has been diagnosed with Acute T-cell Leukemia Lymphoma and is in need of a bone marrow transplant. Family Medicine joined together with Delete Blood Cancer and Jenifer Daniel to recruit bone marrow donors for Ms. Douglas and others facing leukemia. A total of 317 qualifying individuals registered and $712 was raised! We would like to thank all who registered and volunteered toward this cause. Please note, if you stillwish to register, you may contact Tanya Green at 718 901-8219. Bronx-Lebanon Hospital Center is pleased to announce it has received a $25,000 grant from the United Hospital Fund for Promoting Voluntarism. Bronx Lebanon will use these funds to support a Patient Satisfaction Navigator Volunteer Program on the Family Medicine Inpatient Service. Bronx-Lebanon has developed a robust Patient Navigator program, part of which operates on the Family Medicine Inpatient Service. Patient Navigators serve as patient advocates in the hospital, with a focus on ensuring safe discharges. Navigators discuss diagnoses, medications, and discharge instructions with patients, reporting any issues/concerns back to the medical team, and also assist patients in setting up a post-discharge appointment with their primary care physician. Up to 30 volunteers will be recruited for the program over the course of the year, with volunteers required to make a commitment of at least 4 months. Volunteers will serve as extenders for the Patient Navigators in ensuring a safe discharge, but will also focus on comfort and patient satisfaction. The project will be led by Dr. Douglas Reich, Chair of the Department of Family Medicine, with the goal of serving 850 patients. Patient satisfaction surveys will be used to monitor the success of the program. Bronx-Lebanon anticipates that program volunteers could be a source of candidates for its Patient Navigator Program. 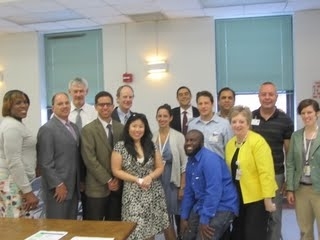 If this program is successful, Bronx-Lebanon will spread the program to other departments within the hospital. The United Hospital Fund is a nonprofit health services research and philanthropic organization whose primary mission is to shape positive change in health care for the people of New York. The Fund advances policies and support programs that promote high-quality, patient-centered health care services that are accessible to all. The Department of Family Medicine is pleased to announce our up and coming Pain Management Program, which will be located on the 8th floor of the Grand Concourse! Spread the Word! Monika Kumanova, MD created a poster to illustrate the joy shared in providing prenatal care to patients at the Ogden Clinic. 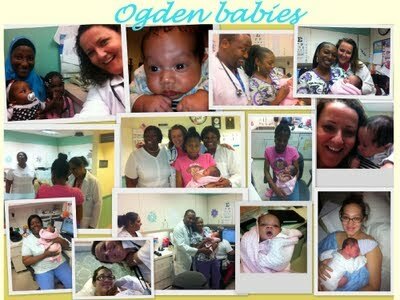 Congratulations to Ogden, its Staff, and Patients!!! Medicine Conference held in Kansas City, MO this August. The Conference is a three-day event designed for residents and medical students. Family medicine leaders and educators conduct special lectures, workshops, procedures courses, and clinics. More than 300 family medicine residency programs are represented in the Exposition Hall. The National Congress of Family Medicine Residents and the National Congress of Student Members hold their annual meetings during the conference. The Family Medicine Department teamed up with Peter Moran and his wife, Mary, in participating in the March of Dimes – March for Babies. This event was held at Saxon Woods on Sunday, April 28th, 2013. Peter and his team raised $1,700. Donations will continue to be accepted until June 20th.